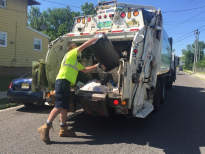 A state-of-the-art landfill, recycling center, composting facility and collection fleet are located at the ACUA Environmental Park in Egg Harbor Township. ACUA operates a 40 million gallon-per-day wastewater facility in Atlantic City, NJ, which is powered by renewable energy. We are committed to seeking out the most sustainable and effective technologies to power our facilities and operations. Giving back to the communities we serve is a top priority for ACUA and its employees. Non-hazardous contaminated soil consists of contaminated earth or fill, typically generated due to spill or leak. It is considered a Special Handling Waste, Waste Type Identification Number 27. ACUA requires the transporter and or generator to contact ACUA prior to delivering the waste. Please click here to complete a special request form, and you will be contacted by ACUA with a disposal date and time. Any other parameter that may be requested by ACUA. Disposal of soils that can be verified as home owner exempt with TPH (Total Petroleum Hydrocarbons) under 5000 ppm (parts per million) are usually approved without TCLP testing. For disposal rates and hours of operation, click here. © ACUA 2019 All Rights Reserved.